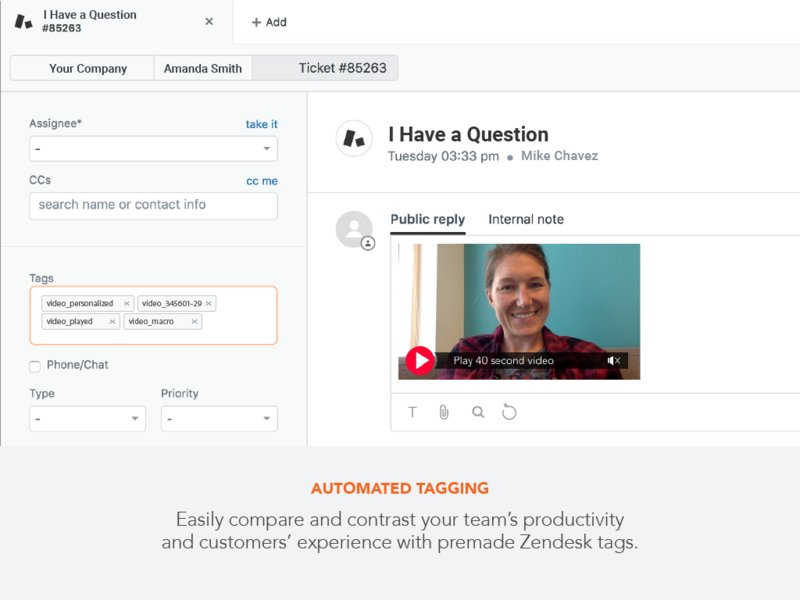 Make Customer Service Personal Again with Video in Zendesk. BombBomb is the easiest way to record, send, and track video messages directly within Zendesk. By replacing some of your plain, typed-out text with a smiling face, some personality, and even a screen recording, Customer Success teams are building trust and relationship, resolving issues more quickly, and delivering an experience that improves satisfaction. 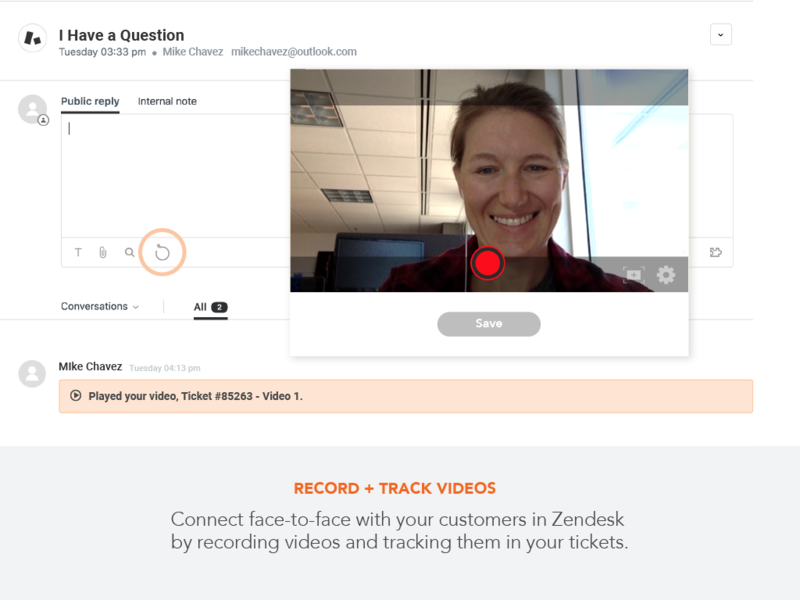 Quickly and easily record and send videos within Zendesk. Your video is being uploaded and encoded while it’s being recorded, so it’s ready to send almost instantly. With screen recording, you can demonstrate, illustrate, present, and explain things more effectively. Bonus: your face can be recorded along with your screen. Tracking tells you the exact who, what, and when of every interaction with the emails you send, giving you actionable insights into each communication. Rehumanize your canned responses by easily inserting videos into macros to improve efficiency, increase engagement, and save time. End the back-and-forth, typed-out email exchanges earlier for happier customers and happier support team members. 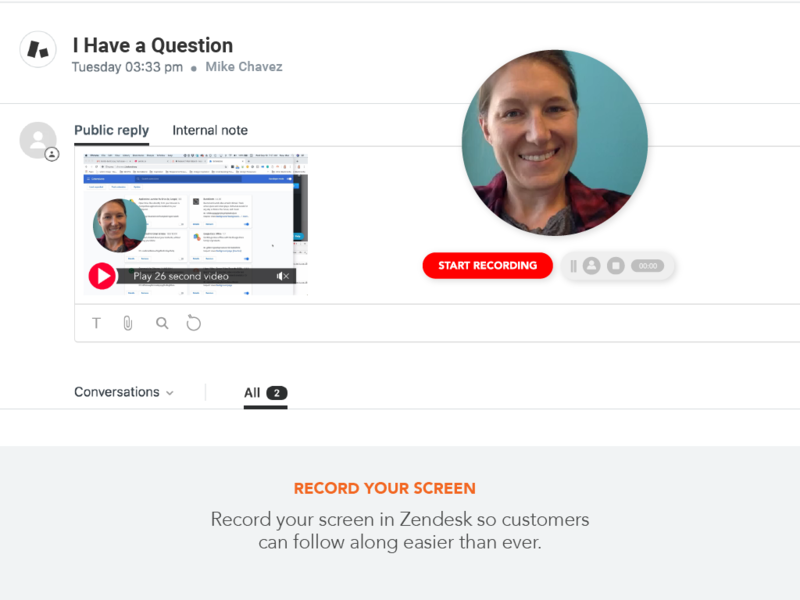 We’ve seen video in Zendesk increase one-touch resolution by 55%, reduce time to resolution by 82%, and increase satisfaction survey completions by 127%. That’s the power of getting the tone right, being face to face, and improving communication quality. Bottom line: BombBomb empowers you and your team to improve customer service with video in Zendesk. If you’re looking to boost your CSAT scores, increase your team’s efficiency, and build relationships with your customers using video...you’re in the right place. First thing’s first: if you don’t have one already, you’ll want to get your very own BombBomb account. Sign up for free here! Once you have a BombBomb account and have installed BombBomb from the Zendesk Marketplace, open a brand new support ticket. You will now see the BombBomb “bomb” icon underneath the text box - click this icon. You will be prompted for your BombBomb login credentials; fill out these fields and click the “Sign In” button. Zendesk will request to access your BombBomb information. Click the “Allow” button to connect these two accounts. You’re all finished! Now, you (and anyone you’ve allowed) can click on the BombBomb icon in a ticket to send BombBomb videos.